Thattai/Thattai murukku/Thattu vadai/Nippattu is a crispy snack that is made with rice flour and it is a favourite snack for all. 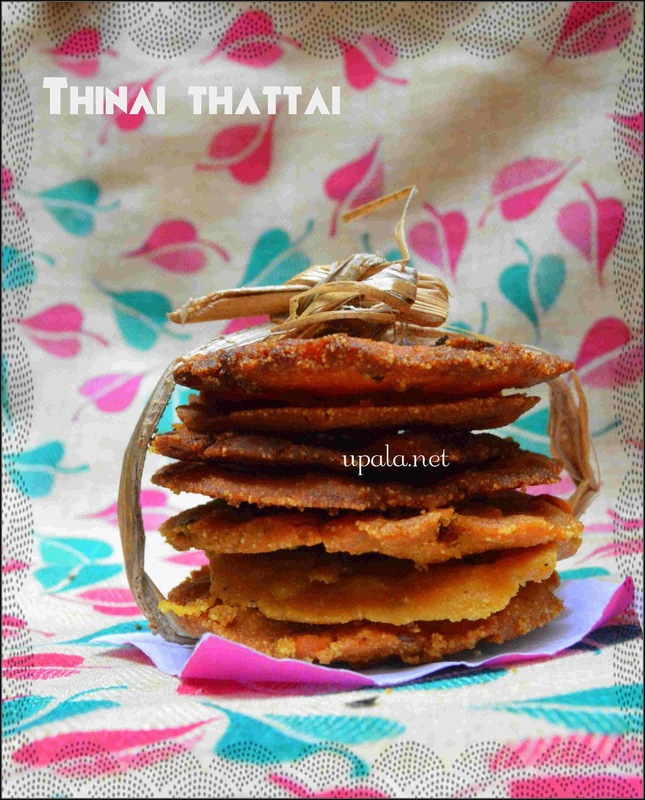 This thattai is a popular South Indian snack and is made during festivals like Diwali and Krishna jayathi. If you love to have a twist in this Thattai by adding a healthy millet variety, then this post of mine will be useful. 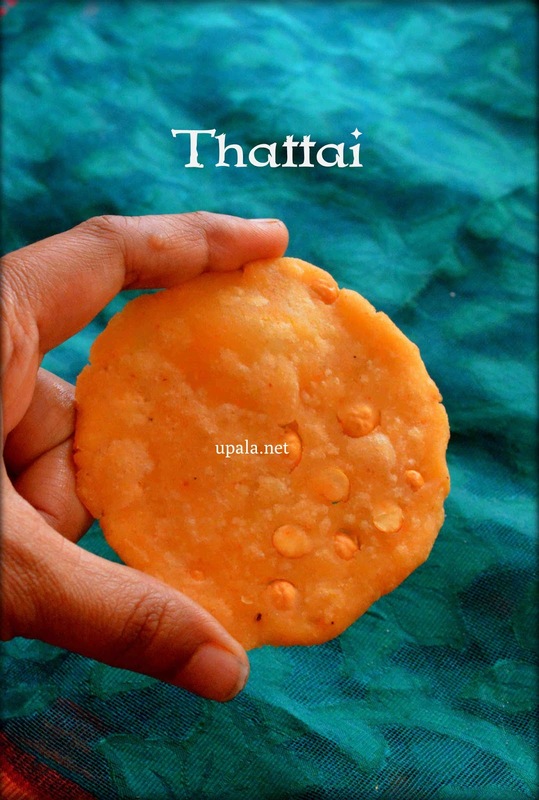 I have made the same thattai with Foxtail millet/Thinai/Navane. Click on this picture to get the recipe. 1) Roast the Urad dal till nice aroma. 2) After it cools, grind it to fine powder. Sieve it and use it. 1) First dry roast the rice flour for 2-3 minutes and leave it to cool down. In a mixing bowl, add Rice flour, Urad dal flour, Roasted gram, Red chilli power, hing, Ghee and Salt. 2) Mix all of these to form a crumbled mixture. Now slowly add water and start kneading to form a stiff dough. 3) Grease a plastic sheet or banana leaf with some oil, next pinch in a medium size ball and form a dough to make a round ball. 4) Press the dough ball on a greased plastic sheet with your palm. Now using a fork gently prick few holes. This will avoid thattai getting puffing up. 5) Heat oil in a kadai and drop the thattai. Fry in medium flame on both sides till they turn crispy and also the sizzling sound stops. Repeat the same for rest of the dough. 6) Drop the thattai on a paper napkin and after it cools store them in an airtight container. 1) You can add finely chopped curry leaves to the dough to get nice flavour. 2) Ghee can be replaced with butter or hot oil. 3) When you drop the thattai the oil needs to be hot, and while frying maintain medium flame. 4) How much ever thin thattais you can make that much fast thattai gets cooked. If it is thick it might take more time to cook also sometimes the middle portion will not be cooked properly. 5) Instead of roasted dal, you can soak channa dal for 1 hour and add to dough. 6) If you are not good at pressing the thattais, keep one dough in between two greased plastic covers and use a flat bottom vessel to press it. 7) Instead of store bough rice flour, you can also use Idiyappam flour or home made rice flour. 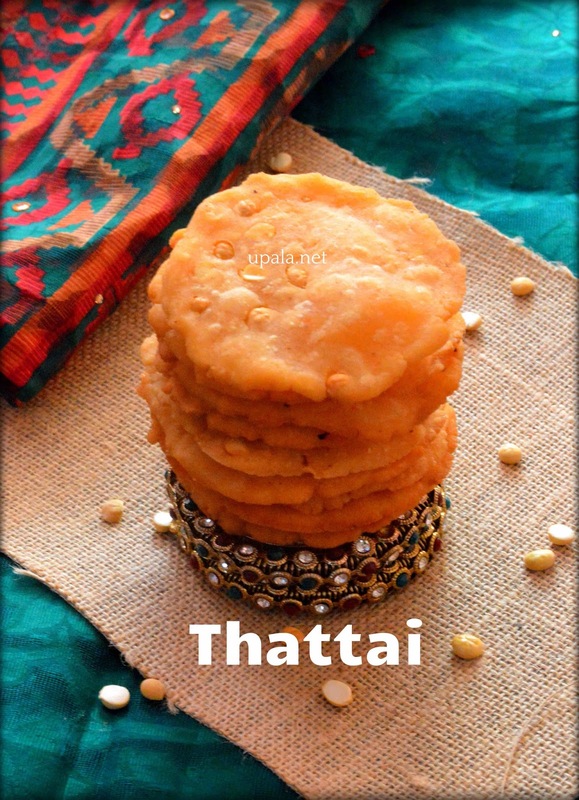 8) If your thattai's are not cooked in middle then drop them again in hot oil to fry for few minutes. 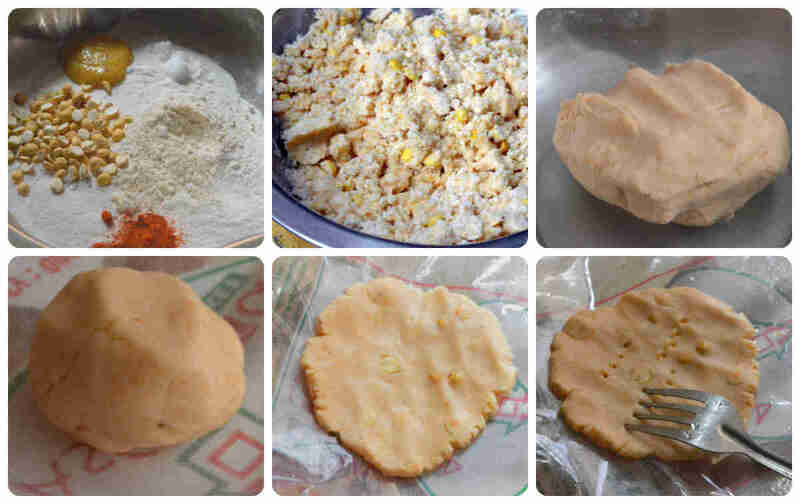 9) Some prefers to press all the dough at one stretch and place them on a cotton cloth or a greased plastic sheet. Then heat oil in a kadai and take the thattais from the cloth to drop them in hot oil one by one. If you are doing more quantity thattais then this method will be useful. 1) Some prefers to add Garlic paste or Red chilli paste or sesame seeds, you can choose any of your choice. 2) In addition to urad dal flour, you can also grind pottukadalai/roasted gram and sieve it and add 1 tbsp of the sieved powder. 3) You can also add few peanuts, few grated coconut as per your choice.